Hello, everyone, My name is Abbas Malik, I hope you guys will be perfectly fine in today's article, I will tell you about a private job that is a great job. 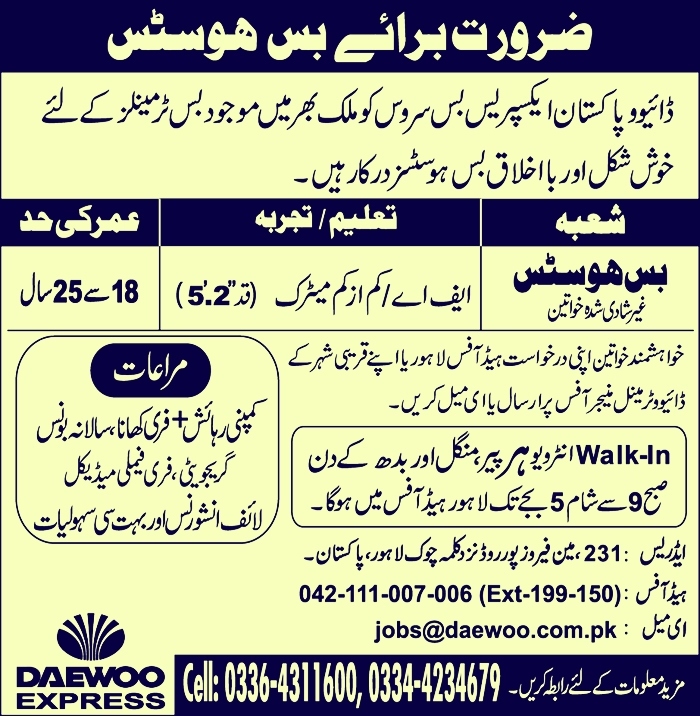 Excellent jobs have been announced by Daewoo Pakistan Express Bus Service. Only girls in this job are eligible to apply. The girls whose education is matric can apply in these jobs. Daewoo Pakistan Express bus runs across Pakistan, you can do this job in any city. This is a private job, but it will be a lot of benefit to you. If your family allows you to do this job you must apply. An only unmarried girl can apply in this job. If you have any questions then you can make a comment regarding this job. You must be 18 to 25 years old for this job. Must be Intermediate and Matric pass to apply in Daewoo Pakistan Express job.